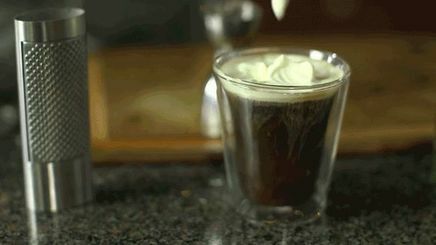 Irish coffee that's perfect for st. pat's day! On Saint Paddy's Day, the drink of choice tends to involve food coloring, cheap beer, and maybe a plastic shamrock or two — but this year, let's do better. Rather than the usual acid-green libation, why not opt for a cocktail that’s authentic and combines two of the greatest substances on the planet: coffee and whiskey? Oh yes, we’re talking about Irish Coffee, which, unlike that green beer you were planning on drinking instead, actually hails from the Emerald Isle. First poured in the 1940s for travelers passing through a local airport, the drink is everything you could ask for in a warming, end-of winter cocktail — caffeinated, boozy, and best of all, just four ingredients long. "It's all in the details," says Jim Meehan, the legendary bartender behind Please Don't Tell in New York City. That means no instant coffee, and no skimping on the whiskey: You're going to need the good Irish stuff to really make St. Patrick proud. The finishing touch? A dollop of homemade whipped cream that, with the help of an old bartender's secret, comes together in just 30 seconds.